For those of you familiar with rugelach no explanation about them is necessary because the delicious and tantalizing taste says it all. If you’re unfamiliar with these tasty bites of sweetness, rugelach are crescent shaped pastries which are made by rolling the dough around a delicious filling. Most often the filling tends to be cinnamon and sugar or a combination of nuts, cinnamon and sugar. Once you put a rugelach in your mouth and taste the rich pastry dough encapsulating the sweet filling you cannot help but want another! Rugelach is the quintessential, Jewish, ethnic food considered by many to be derived from the Austrian kipfel which dates back to the late 1600’s or the Hungarian kifli or perhaps the Polish rogal. Rugelach is, in fact, a Yiddish word meaning “little twists” and used in the plural form; my thought is because you cannot eat just one! The dough can either be soft or flaky, baked until golden brown, and formed into the shape of a crescent. In Europe the dough is typically made with yeast but in America it tends to be made with either cream cheese or sour cream and a butter base. There are even recipes that contain no dairy products. It is the perfect little vessel for a variety of fillings whichever way you decide to make the shell. Rugelach is remarkably versatile since it can be filled with a wide range of fillings including: cinnamon, chocolate, dried fruits, jam, poppy seeds, nuts and even marzipan. In Israel it is typically filled with Halvah, a confection made from sweetened crushed sesame seeds. 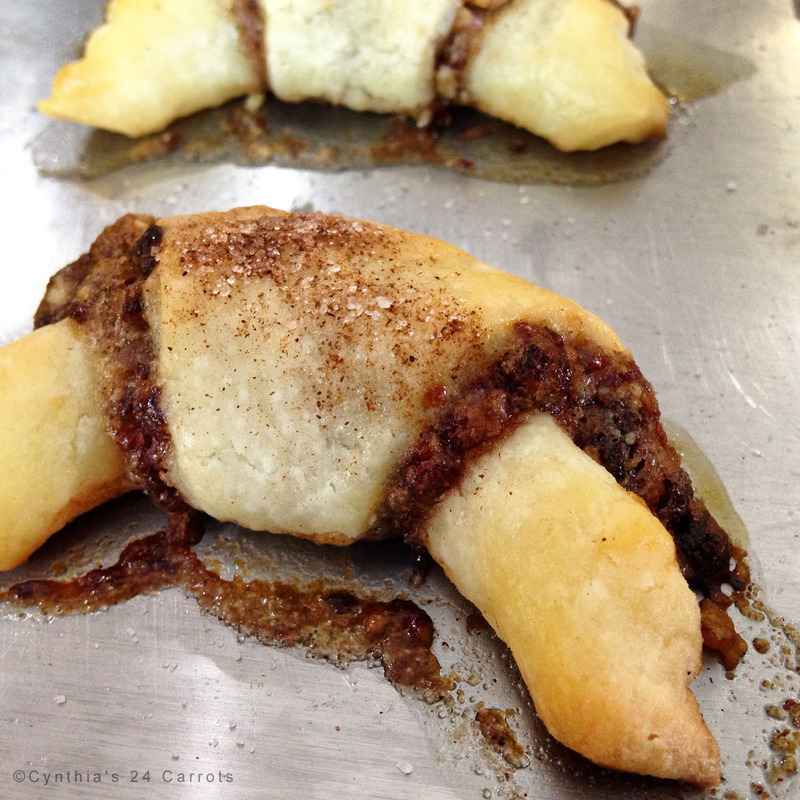 Each filling gives the rugelach a distinct flavor. I invited a friend who I had not seen in a while for this Tea for Modern Times so that we could catch up. The setting was comfortable and uncomplicated and the rugelach was delicious. The time seemed to fly by because we ended up talking and laughing over rugelach and tea for a several hours. 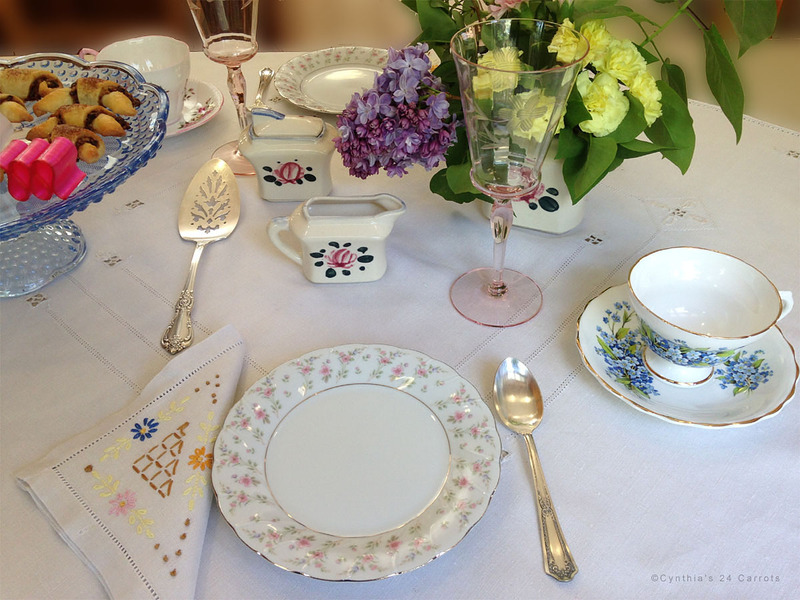 I set the table with an ecru vintage linen pulled string and embroidered tablecloth. The centerpiece was a Wales China, miniature teapot filled with flowers and its matching creamer and sugar bowl were the accent pieces. A light blue, Gorham, hobnail glass pedestal cake stand was chosen to showcase the rugelach. I added a few pieces of thin ribbon candy for a touch of color. A vintage, mid-century silver plated serving piece was laid next to the cake stand. 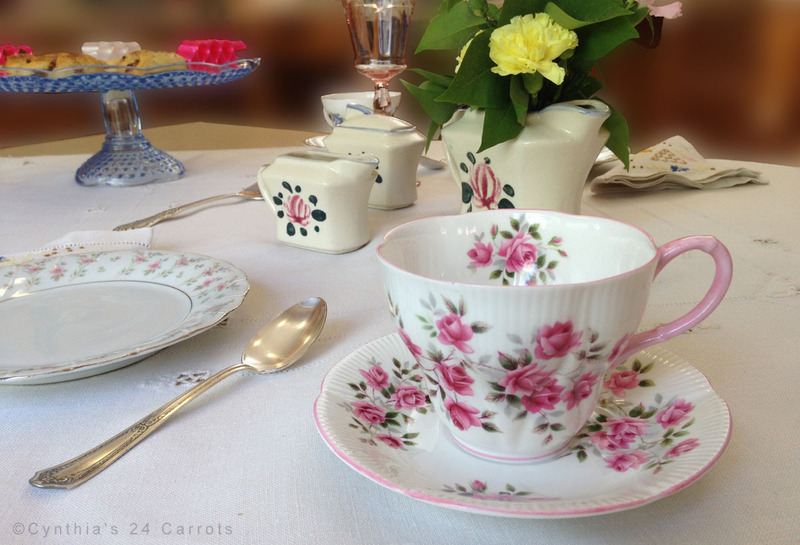 The tea cups were mismatched sets, one tea cup and saucer, Rosina, bone china, in blue floral tones and the other, Royal Albert, bone china in pink to accentuate the blue and pink in the centerpiece. The water goblets were optic, light pink, etched, Depression glass. The vintage linen napkins were embroidered with blue, pink and yellow flowers tying the floral theme together. Silver plated tea spoons, reminiscent of the Art Deco era added an element of gleam to complete the setting. See these and other beautiful vintage items in my Etsy store. Naturally, the rugelach was an integral part of our conversation. Why did I choose to make cherry walnut regulach in place of the traditional raising filling? Well my answer was simple enough; cherries are my favorite dried fruit! In a large bowl of an electric mixer beat butter and cream cheese until light colored at medium speed. Add sugar and continue beating until fluffy. Mix in flour and salt on a low speed just until the dough forms. Gather the dough on a wooden board and gently kneed until smooth then form into a ball. Cut the ball into 8 equal pieces. Each piece will weigh approximately 4 ounces. Form each piece into a flat disc and wrap in plastic wrap. Refrigerate the discs for 1 hour. Note: If you do not have time to roll out and bake the rugelach on the same day then the dough can be prepared to this point and refrigerated for up to one day. Take the dough out of the refrigerator and let it soften slightly before rolling. Into the bowl of a food processor combine the sugar and walnuts and pulse until the walnuts are finely ground. Add the dried cherries and pulse until the cherries are chopped into small pieces. Transfer the mixture to a medium bowl and add the cinnamon and allspice. Combine the ingredients and then with a wooden spoon add the melted butter. Mix well. Work with one disc at a time leaving the others in the refrigerator until ready to use. Take out one disc from the refrigerator and roll out into an 8 inch circle on a lightly floured wooden board. Spread 3 tablespoons of the filling on the dough leaving a ½ border. Cut the round into 8 equal pieces using either a sharp knife or a pastry cutter. Starting at the outer edge or widest end, roll each wedge tightly then place with the tip side down on an ungreased baking sheet and form them into crescents. Repeat until all of the discs are used. Brush the cookies with the egg wash and then sprinkle sugar on the tops. Bake at 350°F until golden brown for approximately 20 minutes. Let the rugelach cool for a few minutes before removing from baking sheet then let them cool completely on a cooling rack. Store them in an airtight container or wrap tightly in plastic wrap and keep at room temperature for up to on week. Note: I used cinnamon sugar to sprinkle on top of the rugelach.